Burton Holmes invented the travel film lecture. For sixty years he was America's most famous travel showman. His name is on a star on Hollywood Boulevard. Who knows anything about Burton Holmes today? This is our tribute to Burton Holmes. 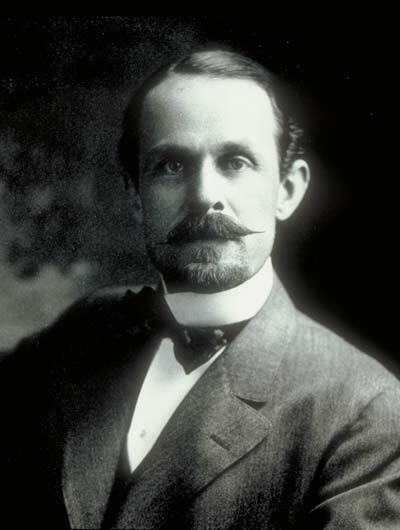 Burton Holmes in 1904. © BHHC; all rights reserved. Burton Holmes invented travelogues. He didn't invent travel stories; those were old when Odysseus recited his trip report to Homer. He didn't invent slide shows; magic lantern slide shows were being given in the 1850's. He didn't invent moving pictures, but he was the first to show them publicly as part of a lecture series. He didn't invent the cross-country travel lecture series; John L. Stoddard had been doing that for fifteen years when Holmes began. But Burton Holmes took an enterprise and made it into an art form. This is our homage to Burton Holmes. 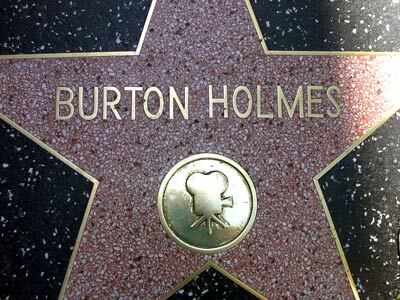 Burton Holmes' Star on Hollywood Boulevard. Photo © Bruce Nolte; used by permission. About Burton Holmes: A short biography of Holmes and an introduction to his travelogues. Pictures of his amazing New York apartment and Hollywood home with his extensive art collections. We even have an early article about him that appeared in MUNSEY'S MAGAZINE in February of 1899, when Holmes was just beginning to become famous. The Travelogues: How he started the Travelogues and what they became. Where the name came from. Hand-painted photographs on glass slides and film. A four-part list 1892-1911; 1911-1931; 1931-1950; 1950-1970 of the travel lectures and shows he and his company gave, between 1892 and 1970. Films and Filmmaking: A major section devoted to Holmes' film work. including information on the recent rediscovery of many of his lost films. Here are some stills from a now-lost film of Holmes visiting Hollywood star Jean Harlow, about 1931. And, not last, the beginnings of a discussion of the posters used to advertise his films. Holmes the Businessman: A business history of Burton Holmes Travelogues (also known as Burton Holmes Incorporated and sometimes as Burton Holmes International). This is covered briefly in the Travelogues pages, but here you will find a much more detailed Timeline. Since the later days of BHI are somewhat obscure, we discuss the crisis year of 1970-71, and memories from some of the people who worked there in the late 1970's and early 1980's. Printed Materials: Writings by Holmes, and about him. Advertisements and Programs for a Burton Holmes Travelogue. Reviews of his lectures. Anything written by or about Holmes goes here, including, as an example, the article about him that appeared in MUNSEY'S MAGAZINE in February of 1899, when Holmes was just beginning to become famous. We also have online a complete scan of a 1902 brochure for his lecture series; two back-to-back Programs from the 1927-1928 season; and a Program from the 1928-1929 season. In addition to Genoa Caldwell's Burton Holmes Travelogues (2006), there is also a 2008 calendar from Taschen , using the same images published in the book. A paperback edition of the book was planned by Taschen, but we haven't seen it. Associates, Partners, and Staff: Biographical information on people who worked with Burton Holmes in his many enterprises. All were important, but many of them were critical to the success of his work and participated in the filming and presentation of the Travelogues. Let's start with cinematographer André de la Varre, who collaborated with Holmes for many years. UPDATE 15 January 2008: René de la Varre's book about his father, Like Pop, Like Schling: A Life of Travel, Tragedy, and Triumph , has been published and is now available from him or via Amazon. Rediscovery: In the last few years, Burton Holmes' work has been rediscovered by new generations of filmmakers, travel historians, and general enthusiasts. With new books on Holmes and Travelogues, and the recent recovery of much of his lost film archive, we can expect a continuing and growing interest in the cultural legacy he gave us. A Rough Guide to collections and archives holding significant materials about Holmes, his lectures and films, and his businesses. Some of Holmes's films are now available (January 2008) for industry professional use and release through two stock agencies. Links to other sites that expand upon the material on this site, and will be of interest to people wanting to learn more about Holmes and his work. The Burton Holmes dot Org store, where we try to help you find things by and about Holmes, and things related to travelogues, travel, photography, and whatever else seems right. What's New on this website? Detail on our updates and changes. Contact us if you have special material about Holmes or his Travelogue companies, or just want to know more. 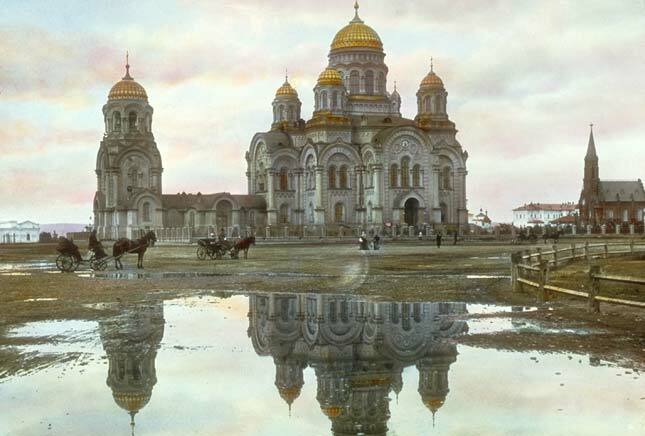 Irkutsk Cathedral, 1901. © BHHC; all rights reserved. Update history: This page originally created 8 December 1999. Latest revision 7 October 2016. Genoa Caldwell's new book of Holmes' photographs is visually stunning. You can see why Holmes became the most famous travel photographer of his time. Thayer Soule's memoirs of working for Holmes are lots of fun. You will learn how this amazing work of film and theater came together. And this man loved his job! Genoa Caldwell's earlier book about Holmes and his photographs (Harry N. Abrams, 1977) is available today from a number of dealers. This was produced with the cooperation of Burton Holmes, Inc., while the company was still in business.